Del Mar Photonics, Inc. is an established manufacturer and system integrator of advanced photonics products for scientific and industrial applications. 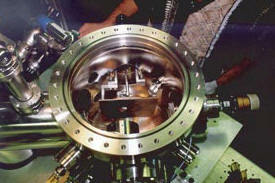 Product portfolio includes ultrafast laser oscillators and amplifiers based on Ti:Sapphire, Cr:Forsterite, Er- and Yb- doped fibers; variety of measurement tools such as autocorrelators, SPIDER and cross-correlator and a femtosecond dynamic research tools such as Beacon fluorescence up-conversion and Hatteras transient spectroscopy pump-probe systems. Del Mar Photonics offers integration of femtosecond laser systems for multiphoton imaging, scanning probe microscopy, micromachining, molecular dynamic, X-ray and plasma research, THz generation and spectroscopy and other applications. Del Mar Photonics, Inc. is a private company headquartered in San Diego, CA and was founded in 2005 as a spin-off of the Del Mar Ventures femtosecond systems division. Del Mar Photonics team includes industry veterans, bright young researches and engineers as well as strong team of part time and seasonal sales personnel and ready to join our team students and graduated students, currently working with us on a part time basis. If you have trouble navigating our website, just send us a quick e-mail and we'll be happy to answer all your questions! Swamis 1086/543 fiber laser system with wavelengths of 1086 and 543 nm and pulse energies of 1.0 and 0.3 μJ, respectively, at a repetition rate of 4 MHz. ĀNUENUE - patented miniature Holographic Fourier Transform Spectrometer for the UV/Visible/NIR New! 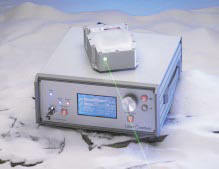 High-resolution laser spectrometer - New! Super-frequency-stable Ti:Sapphire laser TIS-SF-777 now has an absolute linewidth < 10 kHz rms - New! Nd:YAG lasers and systems New! High resolution MFM image of Seagate Barracuda 750Gb Hard Drive, ST3750640AS. Send us your sample for nano-characterization!!! 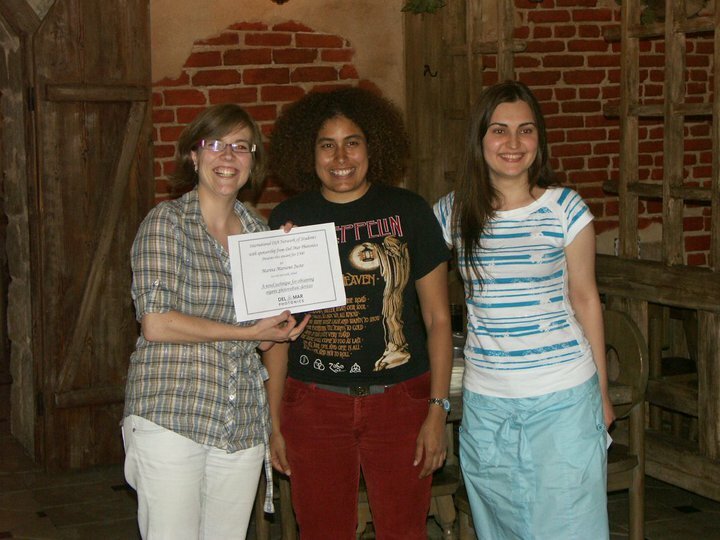 Marina Mariano Juste from the ICFO - Institut de Ciències Fotòniques, Barcelona, Spain presents her award winning talk "A novel technique for obtaining organic photovoltaic devices"
Cinia Schriber, from ETH in Zurich presents her award winning poster "Optical Characterization and Damage Testing of Semiconductor Saturable Absorber Mirrors (SESAMs)"
Del Mar Photonics Sale new items are added daily! Research Highlights & News from Appl. Phys. Lett. Del Mar Photonics Man on the Moon special !!! 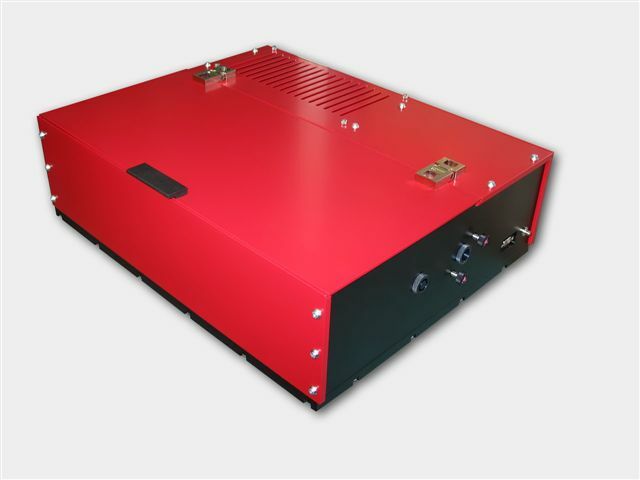 Nd:YAG Laser LQ929 is used as pump laser for second stage amplifier in Femtosecond Terawatt Ti:sapphire Laser System Teahupoo MPA-XL - New! Green fiber laser for Ti:Sapphire pumping - New! Del Mar Photonics has delivered Trestles 100 femtosecond Ti:Sapphire laser pumped with DPSS laser with 5 W output to FDA (Federal and Drug Administration). 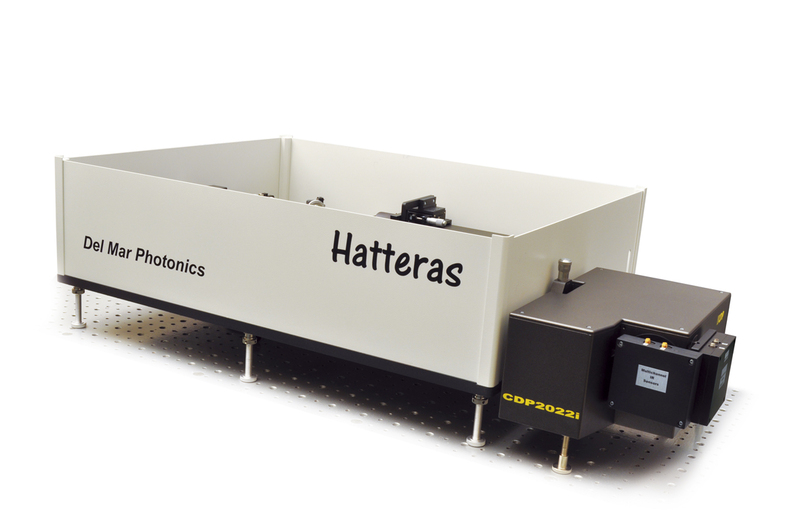 Business Wire: Del Mar Photonics Announces New Mavericks (TM) Long Wavelength Femtosecond Laser for Scientific Research and Enhanced Biological Imaging. Trestles Finesse Ti:Sapphire oscillator !!! New Amplified Ti:Sapphire System Teahupoo !!! Peter Hommelhoff and Catherine Kealhofer reviewing the "SPIDERgram"
Christophe Couteau, Photonic Entanglement Group (PEG) of Prof Gregor Weihs, Institute for Quantum Computing (IQC). New Pismo Pulse Picker for selection train of pulses from Tsunami and Spitfire - see what we can do! 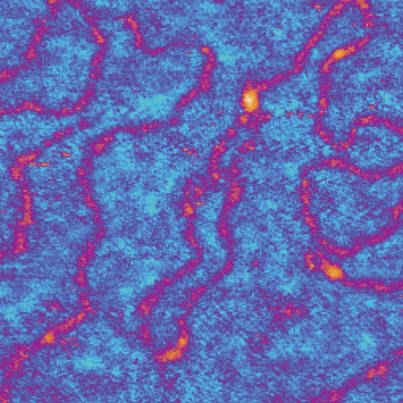 High-resolution Optical Coherence Tomography Over a Large Depth Range with an Axicon Lens by Zhihua Ding et al. Dynamically Adjustable Annular Laser Trapping for Sperm Chemotaxis Study by Bing Shao et al. IR viewports with Ultra high vacuum compatibilty and a baking temperature above 300deg C.
Rutile (TiO2) coupling prism, 10x10x8 mm - in stock! Rutile (TiO2) coupling prism, 5x5x5 mm - in stock! 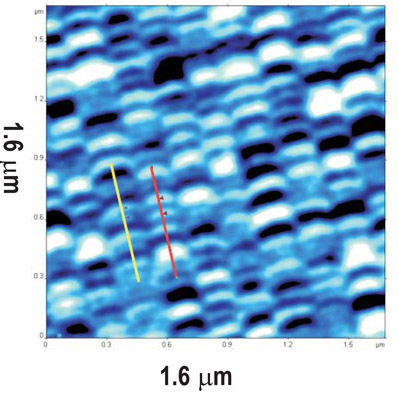 Near IR viewers are sensitive up to 2000 nm and can be used to observe indirect radiation of IR LED's and diode lasers, Nd:YAG, Ti:Sapphire, Cr:Forsterite, dye lasers and other laser sources. Where Del Mar Photonics product's names come from? 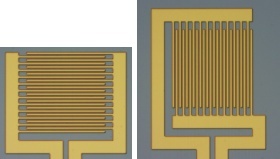 Del Mar means 'by the sea", and Photonics is all about optical waves. So we decided to choose terms popular in surfing and sailing communities. Our femtosecond lasers, amplifiers and systems are named after popular surf breaks around the world, and many other products names after sailing and nautical terms. Click here to learn more. 1 CdSe powder 10-30 um (within 1 batch), 99.999 %, 10 kg. 2 CdSe, 6 X 4 X 2 mm, 6 X 4 // (0001), all sides polished 60/40, high resistivity (>/= 10^11 Ohm*cm), 11 pcs. 3 CdSe, random oriented, 10 X 10 X 0.5mm, 2 sides polished 60/40, high resistivity (>/= 10^11 Ohm*cm), 1 pc. 4 CdSe (10-10), 25X15X1 mm, 2 sides polished 60/40, low resistivity (< 1 Ohm*cm), 2 pc. 5 CdSe, Dia: 12.7 X 3.2 mm, <0001> // Dia: 12.7, 2 sides polished 60/40, high resistivity (>/= 10^11 Ohm*cm), 1 pc. 6 CdSe, Dia: 10 X 0.3 mm, // "c", polished 60/40, 5 pcs. 7 CdSe, 5X5X0.5 mm, (0001), all sides polished 60/40, high resistivity (>/= 10^11 Ohm*cm), 5 pcs. 8 CdSe, (0001), 10 X 10 X 0.5 mm, 1 side polished 60/40, 1 side grinded, low resistivity (< 1 Ohm*cm), 7 pcs. 9 CdSe, // "c", 10 X 10 X 1 mm, 2 sides polished 60/40, low resistivity (< 1 Ohm*cm), 5 pcs. 10 CdSe Dia: 5 X 5 mm, (0001), 2 sides polished 60/40. High resistivity (>/= 10^11 Ohm*cm), 4 pcs. 11 CdSe, 5 X 5 X 1 mm, (0001), all sides polished 60/40, low resistivity(< 1 Ohm*cm), 10 pcs. 12 CdSe, random oriented, 10 X 10 X 0.5 mm, 2 sides polished 60/40, low resistivity (< 1 Ohm*cm), 9 pcs. 1 ZnTe 10 x 10 x 0.5 mm, (110), 2 sides polished 60/40, 3pcs. 2 ZnTe 10 x 8 x 0.8 mm, (110), 2 sides polished 60/40, 2pcs. 3 ZnTe 10 x 8 x 0.2 mm, (110), 2 sides polished 60/40, 1pc. 4. ZnTe 10 x 8 x 1 mm, (110), 2 sides polished 60/40, 2pcs. 5. ZnTe 10 x 10 x 0.4 mm, (110), 2 sides polished 60/40, 1pc. 1 CdTe (110), 10 X 8 X 3 mm, 2 sides polished 60/40, high resistivity (>/= 10^6 Ohm*cm), n-type, 1 pc. 2 CdTe, 5 X 5 X 1.3 mm, (110) at 45deg to 5 X 5 mm, 2 sides polished 60/40, high resistivity (>/= 10^6 Ohm*cm), 7 pcs. 3 CdTe, 6 X 4 X 2 mm, 6 X 4 // (111), all sides polished 60/40, high resistivity (>/= 10^6 Ohm*cm), 8 pcs. 4 CdTe, Dia: 6 X 8 mm, Dia: 6 //(111), high resistivity (>/= 10^6 Ohm*cm), 2 pcs. 5 CdTe, Dia: 15 X 2 mm, (110), 2 sides polished 60/40, high resistivity (>/= 10^6 Ohm*cm), 3 pcs. 6 CdTe, 10 X 10 X 1 mm, random oriented, 2 sides inspection polished, high resistivity (>/= 10^6 Ohm*cm), 4 pcs. 7 CdTe, 7 X 5 X 0.5 mm, (110), 3 sides polished 60/40, high resistivity(>/= 10^6 Ohm*cm), 5 pcs. 8 CdTe, 30 X 2 X 1 mm, 30 X 2 // (110), 2 sides polished 60/40, high resistivity (>/= 10^6 Ohm*cm), 3 pcs. 9 CdTe, Dia: 27 X 1.5 mm, (111), 2 sides polished 60/40, high resistivity (>/= 10^6 Ohm*cm),1 pc. 10 CdTe, 30 X 3 X 3 mm, 30 X 3 // (111), 3 X 3 // (110), all sp 60/40, high resistivity (>/= 10^6 Ohm*cm), 2 pcs. 11 CdTe, 10 X 10 X 0.5 mm, (110), 1 side polished 60/40, 1 side fine grinded, low resistivity, p-type, 2 pcs. 12 CdTe, 10 X 10 X 0.2 mm, (110), 2 sides polished 60/40, high resistivity (>/= 10^6 Ohm*cm), 1 pc. 13 CdTe, 10 X 5 X 1 mm, (110), 2 sides polished 60/40, high resistivity(>/= 10^6 Ohm*cm), 1 pc. 14 CdTe, 5 X 5 X 2 mm, (110), 2 sides polished 60/40, high resistivity (>/= 10^6 Ohm*cm), 1 pc. 15 CdTe, 10 X 10 X 2 mm, (110)/(110)/(100), 2 sides polished 60/40, high resistivity (>/= 10^6 Ohm*cm), 1 pcs. 16 CdTe, 10 X 10 X 0.5 mm, (100), 1 side polished 60/40, 1 side fine grinded, p-type, 3 pcs. 17 CdTe, 10 X 10 X 0.5 mm, random oriented, 1 side polished 60/40, 1 side fine grinded, p-type, 7 pcs. 18 CdTe, 10 X 10 X 0.5 mm, (100), 2 sides polished 60/40, p-type, 2 pcs. 19 CdTe, 10 X 10 X 0.5 mm, (110), 2 sides polished 60/40, high resistivity (>/= 10^6 Ohm*cm), 1 pc. 20 CdTe, 10 X 10 X 0.5 mm, (111), 2 sides polished 60/40, high resistivity (>/= 10^6 Ohm*cm), 1 pc. 21 CdTe, 10 X 10 X 1 mm, (100), 2 sides polished 60/40, high resistivity (>/= 10^6 Ohm*cm), 4 pcs. 22 CdTe, 20 X 20 X 1 mm, (110), 2 sides polished 40/20, high resistivity (>/= 10^6 Ohm*cm), 1 pc. Del Mar Photonics stock crystal division distributes Lithium Niobate wafers, Silicon Wafers, III-V Materials and other Crystal Substrates for use in Electronics.